She is the first member of the Straw Hat Pirates to appear (in the anime), but the third to align herself with the crew, and the fifth to actually join. Possibly one of the best (or even the best) navigators currently sailing the Grand Line, she has the ability to recognize and analyze even the slightest changes in the weather through sheer intuition, thus saving the ship and the crew from the very unstable Grand Line weather on multiple occasions. Nami has a tattoo on her left shoulder (a homage to her past), where she used to have a shark tattoo for being a member of Arlong's Crew. The new tattoo represents mikan (a fruit commonly know as tangerine) and pinwheels. She respects Luffy's qualities as a leader, but often gets angry of his irrational thinking and short attention span, even so she trusts him with her life. Despite the fact that Nami has deceived the crew, Luffy still trusts her enough to allow her to safe-keep his precious straw hat. She is almost always the one who gives orders on the ship (much to the Zoro's resentment) because of Luffy's usual lack of common sense. She often comically beats or hits her other crewmates for their nonsense, which occurs quite often. Robin is actually the only person Nami doesn't try to boss, and she refered to her as the only person who understands her, though in a comical fashion. She is very manipulative as well and can even turn an entire conversation in her favor when necessary, often putting on disguses and tricking the enemy. Acting as the "mother" of the crew, Nami doesn't understand or approve of the boys' often macho attitudes and principles. These are the only situations where Nami doesn't get the final word. Nami's two favorite things are money and tangerines. She is greedy and will do anything, aside from abandoning or killing her friends, for money. Due to her past - After having gathered money for 8 years (and even before that often stole things), Nami is naturally accustomed to it, but thinks of her friends as more important. She is very manipulative, and often takes advantage of Sanji for his devotion to her and Usopp to maintain her weapons. Roronoa Zoro tries not to fall for her schemes, but ends up a victim like the rest, usually due to debt and blackmail. 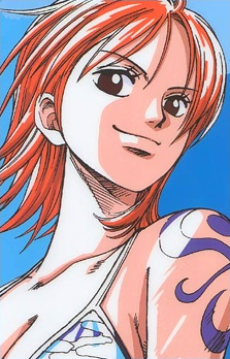 Nami also tries to avoid fights, and is one of the less adventurous and brave members of the crew. However, since the invention of her Clima Tact (A weapon that forms weather patterns), she is now seen fighting her own battles instead of becoming the 'easy target', as she doesn't want to be the one being saved anymore.